The book is available for purchase at Steam at Harper’s Ferry. can be seen in Art Walk participant windows. 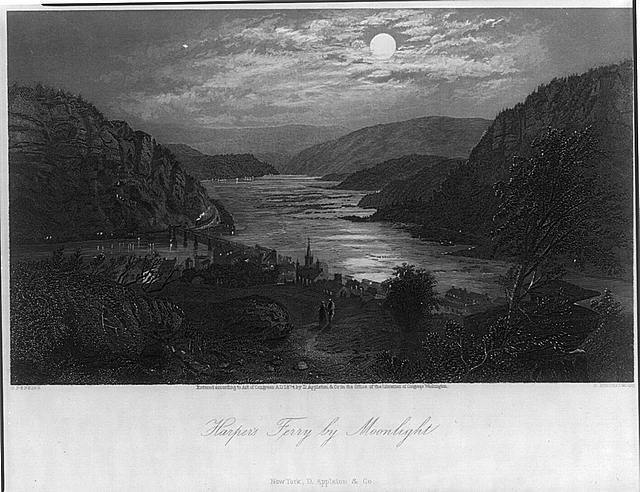 The print is based on an illustration of Maryland Heights by Granville Perkins for the publication “Picturesque America” published in 1893. The evening falls among the mountains, calm and peaceful. The huge shadows of the dusky heights overcast the town and river. 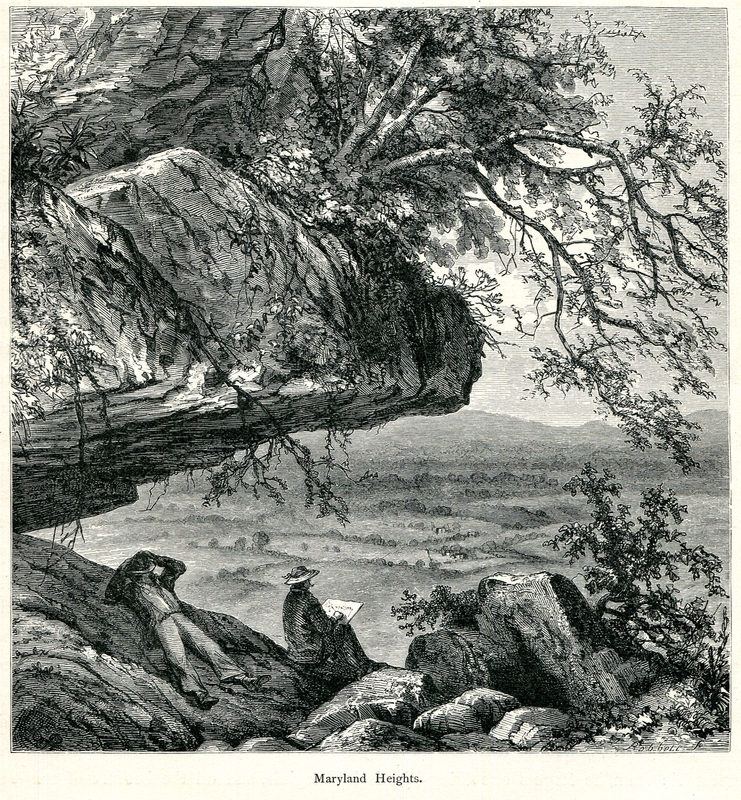 If it is in the season – for artists, like migratory birds, have their time for appearing in different places, and for disappearing – some wandering artist from Baltimore, Washington, or, in rarer cases, New York, may stroll in with sketching-portfolio and camp-stool, and exhibit to the wondering natives the counterfeit presentment of familiar scenes. 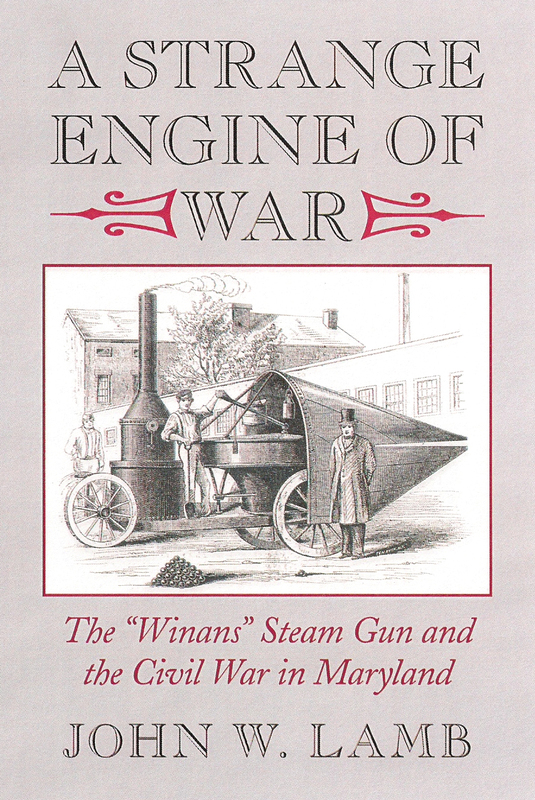 When I wrote about the Winans Steam Gun back in October 2011, I had no idea how popular the post would be, and I certainly had no idea that there was a new book about the subject by John Lamb! I will post more in the coming weeks, but I wanted to let you know about this event well in advance. 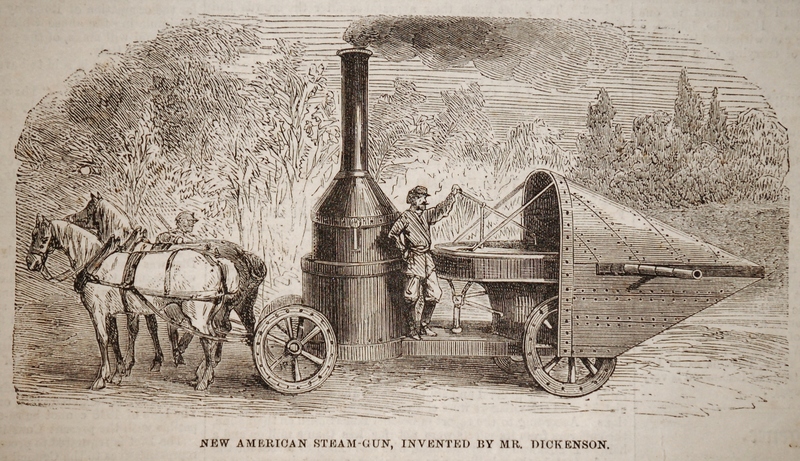 Steam at Harper’s Ferry will be hosting a book signing and historical presentation on the legendary Winans Steam Gun from the Civil War, 2-4 p.m., Sunday, May 6, with John Lamb, author of A Strange Engine of War: The “Winans” Steam Gun and Maryland in the Civil War. Hope to see you there! If you can’t make the event, get your hands on the book. Harper’s Ferry visitors have a unique opportunity to walk alongside two historic canals. One, the Chesapeake and Ohio Canal, which extends from Washington, DC to Cumberland, MD for a distance of about 185 miles and the other, the Shenandoah Canal also known as the Shenandoah Navigation, which is often overlooked even though its construction began twenty-two years earlier than that of the C&O. 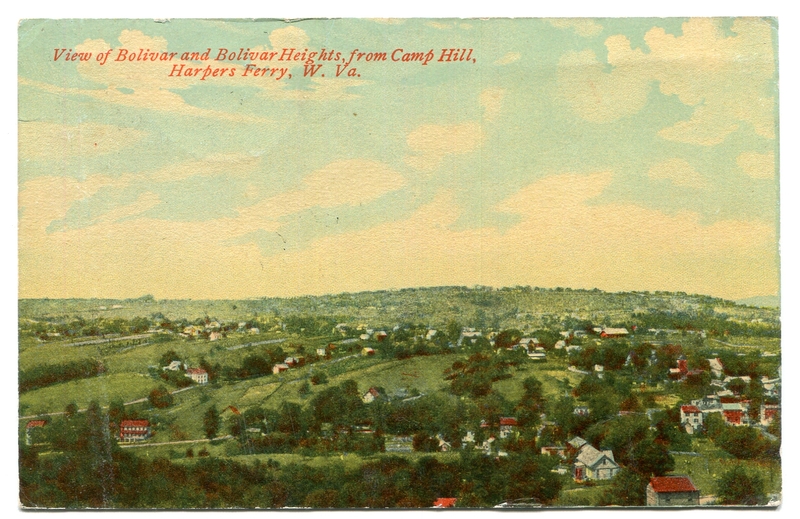 The canal became obsolete for use as a canal once the C&O was completed, however, the water siphoned from the Shenandoah fed industries, such as the paper mill on Virginius Island, through the early 1900s. If you take the Harper’s Ferry National Historic Park bus from the Park entrance at Cavalier Heights, you can still see lock ruins, especially during this time of year. The train tracks along this portion of the Shenandoah were once owned by the Winchester & Potomac Railroad, considered a Confederate railroad system during the Civil War. 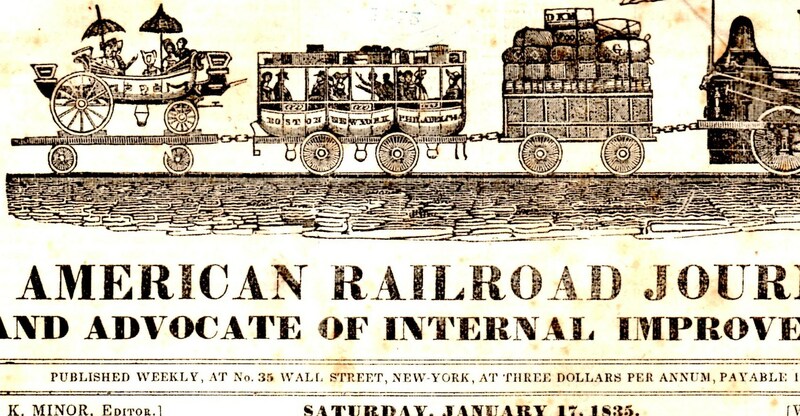 In 1867, the Winchester & Potomac Railroad was renamed the Winchester & Strasbourg Railroad. A few weeks ago, Harper’s Ferry experienced some excitement as ! !Snow Panic!! set in, although short lived. 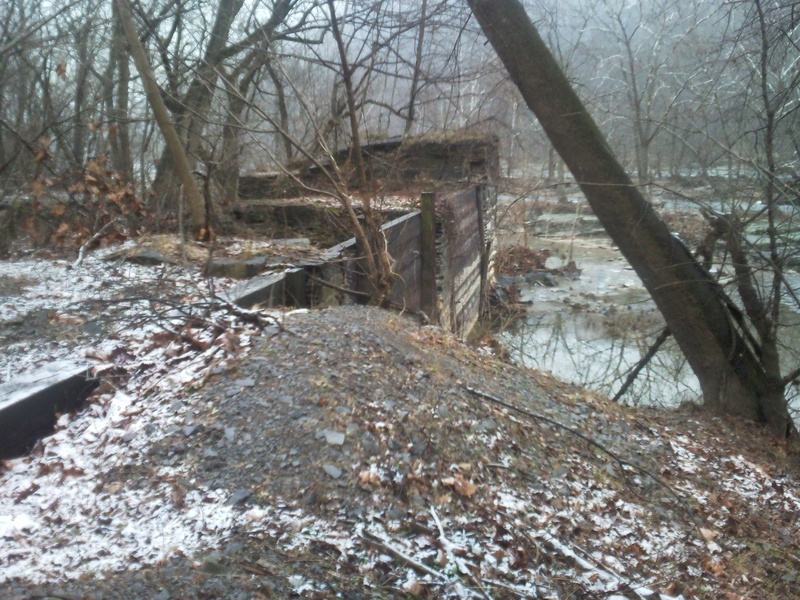 Here is a photo showing the Shenadoah Canal lock still on the job managing the Shenandoah in the midst of the fearsome flurries. I follow a Yahoo! group about the B&O Railroad. I asked Mr. Cohen if I could repost a recent post of his to the group. He said yes, and here it is. If you want to get in touch with Mr. Cohen, there is a group email address below. The Washington County Branch RR began operations in 1867 or 1868 from Weverton, which about a mile and a half to 2 miles west of Knoxville. The branch was something like 24 miles long and lasted until 1975-1978 when it was removed in stages. Today, IF you know where to look there are evidences to find at Weverton where the branch headed towards Hagerstown. They are located almost exactly opposite the C&O Canal lock house there off old Keep Tryst Rd. I passed right by there yesterday afternoon and this is an excellent time to check it out as the weeds and underbrush are non-existent for photos, especially using the lock house as a prop for photos, maybe a bit of an anachronism with current motive power behind the 180 years old (or thereabouts) lock house. Some of the rails for the branch are still there for a few dozen yards before they were removed heading up the valley where I think Israel Creek flows. The B&O backed this project and from what I have read, it wasn’t very successful financially. The last passenger operations ended October 31,1949 with I think the Doodlebug running a triangle route between Brunswick, Frederick and Hagerstown and back again. There were a number of stations along the line and some have good photos surviving. A few are quite elusive to find. The Weverton station was closed from what I have determined in 1929 or thereabouts and was demolished in early 1936, just before the big Potomac flood of that year. Route 340 today occupies much of the old town along the hillside which was removed to make way for that work in the 1960’s. The last permanently assigned station agent Franklin Garber retired in 1929, died in 1944 and is the great-great grandfather of the B&O RR HS Sentinel editor, Harry Meem. Franklin Garber is now a permanent resident in the cemetery in Knoxville at the top of the hill there. Weverton was named for Caspar Wever (those are the correct spellings) who attempted to establish a milling community at this point but it was too isolated even back then to attract the necessary development. Wever led an interesting past being involved in construction of the old National Road, what later became Route 40 and construction of the B&O mainline. 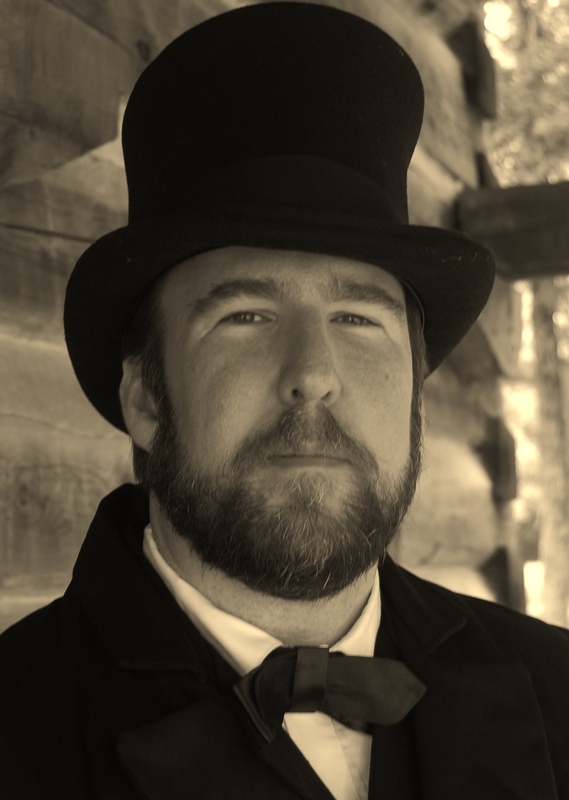 He was involved in the faulty construction of the first B&O bridge across the Potomac at Harpers Ferry and that forever clouded his future 25 years of life before expiring in early 1861. As an aside, if you want to know more about Wever, there has been an informative booklet published by Peter Maynard plus I think Dilts’ book covers some of his shenanigans as well.